The Ypsilanti Community Schools Board of Education has adopted the "Solutions not Suspensions" pledge and a Student Code of Conduct. Bob Eccles reports on a new pledge to provide "solutions not suspensions" for its students. 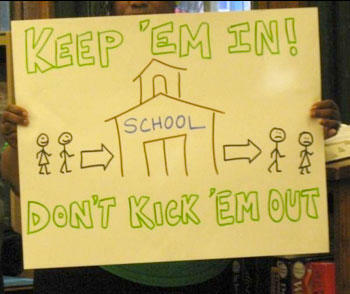 Solutions Not Suspensions calls for a moratorium on out-of-school suspensions. The pledge urges district to use suspensions and expulsions as a last resort, and while that philosophy isn't really a part of the Code of Conduct, staff felt it was important to have the code in place for the rest of the school year. Changes in the language of the code are expected before next school year to better reflect the district's desire to focus on restorative rather than punitive practices.